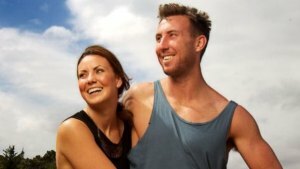 Brock, you were one of the first AFL footballers to publicly declare their support for the LBTQI community. Looking back on that pride march, do you think that it was a turning point for attitudes in the AFL to change? I think so. It was great that Dan Jackson came along and showed his support. The event gathered so much media coverage and ultimately that was a good thing. And from there it grew. More people starting talking about it and more support grew for the LBTQI community. Now we’ve just had our first pride game so the sentiment of supporting gay rights has come a long way. I’m pretty proud of that. After marching in the Pride March, did you receive any negative feedback or criticism? I was expecting a little bit of backlash because people just love to criticise, especially if you’re in the public spotlight. But 99% of the feedback I got was great. The people that did criticise had baseless arguments and couldn’t come up with anything that was constructive, so they held no weight. You spent quite a while in the inner sanctum of two football clubs, so you would be the best person to ask – do you think that football clubs are ready and prepared for a player to come out of the closet? I would like to think so. I can only speak for 2 clubs and I’m sure 99% of the playing group wouldn’t care and would be supportive. You have this bond with your teammates that is pretty strong because you spend so much time with them and go through so much with them. They would be supportive of any of their teammates if they happen to be gay. Your openly gay sister must be so inspirational to you, what qualities do you draw from her ion your everyday life? Just to be happy with yourself and proud of yourself. We were very lucky to be raised and taught to not care what anyone else thinks. That’s held us in really good stead. And that’s so evident with Ellie. To proudly say that you’re gay to the world amidst some pretty loud opposition to being gay is something that speaks volumes in terms of strength, resilience and character. What were your fondest memories of being at the Melbourne Football Club? Definitely early on in my career, the first 3 years when we were playing finals. That 06 Elimination final was certainly the highlight of my career. Also the playing group. As I said earlier, you form this bond with so many players and carry that with you for the rest of your life. Who was the best player that you played with and against? Chris Judd and Chris Judd. Absolute freak of player. And not by accident. The time and dedication he put into his craft was unbelievable. Yes he had raw talent but that’s wasted without hard work. And a great guy too, would give his time to anyone. Where does your heart belong, Melbourne or Carlton? I feel more of a connection now to Carlton because I was more recently there. But my heart still resides with Melbourne. They were my first club and gave me the opportunity to live out my dream. Now you have retired form AFL, do you feel you have achieved everything you wanted to achieve? When I was a kid all I wanted to do was play one game. Then when you play one game you want to play more and eventually play in a premiership. So the answer is no, I didn’t. But life isn’t always a fairytale. Do you think we can ever expect a Pride Round? Do you still go to the footy much? No, hardly ever. It makes me miss the game and running out onto the G so much more. Maybe in a few years I’ll start going to watch the Dees a bit more regularly. Where did the nickname “Chooka” come from? Nathan Brown. He said that every footy club had a Chooka and Chooka McLean sounded the best. Where to from here for Brock McLean? Work and uni is my focus now. Working as an equities analyst and finishing off my finance degree. I’m working towards my next goal in life, which is getting over to New York and working on Wall st.